Danielle Turner reports on the papers from the session The World of Images of the Scandinavian Rune Stones, which was part of the 105th Annual Conference of the Society for the Advancement of Scandinavian Study held earlier this year in Columbus, Ohio. 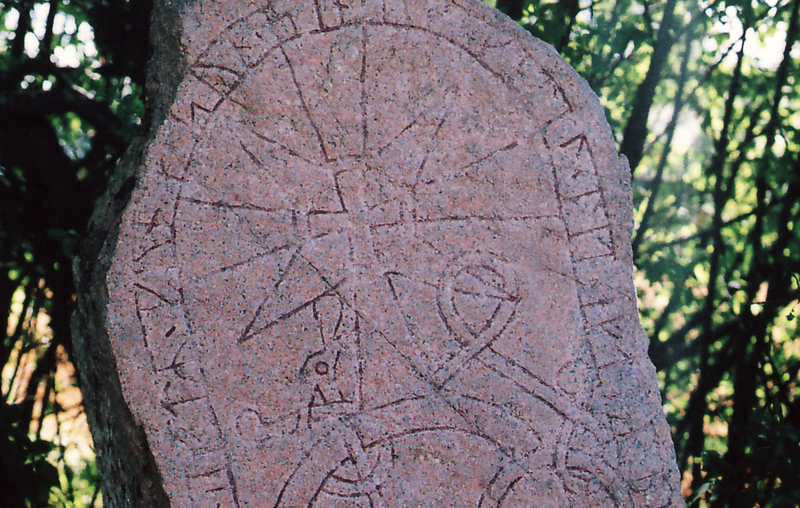 The Vik stone (U 288), Uppland, Sweden. 12th cent., Image courtesy of Wikimedia Commons; photographer: Robin Iversen. Lise Gjedssø Bertelsen, Non Resident Research Fellow, Department of Archaeology and Ancient History, Uppsala University started with her presentation, Introduction to the World of Images of the Scandinavian Rune Stones. She shows us that three styles emerged to form the bases of Late Viking Age (ca. 950 – 1135 AD) art: Mammen, Ringerike, and Urnes. These three styles can be found all over Scandinavia from this time. Mammen style increased in popularity following the raising of the rune stone of King Harald Bluetooth in Jelling, Denmark where as Ringerike style flourished under King Canute the Great of Denmark, England, Norway and parts of Sweden. These styles shared similar motifs, most notably the cross of Christ, crucifix, triquetrae, quadrupeds, birds, ships, and masks. More details about Dr. Bertelsen’s study can be found in her recently published article, “The Cross Motif on Late Viking Age Art Picture Runestones in Västergötland,” in Lund Archaeological Review Vol. 20 (2014). Kate Heslop, Assistant Professor and Undergraduate Advisor and University of California, Berkley, followed with her presentation on Sigurd, a multimedia hero: visual narration in the Viking Age. Kate studies runes related to the Norse legend of Sigurd, slayer of the dragon Fafnir which is recorded in eddic poetry, in the Codex Regius manuscript of the Poetic Edda (Gks 2365 4to, c. 1270), and written prose, in the Saga of the Völsungs. Ramsund rock engraving (Sö 101), Mälar Valley, Södermanland, Sweden. 11th cent., 4.7 x 1.8 m. Image courtesy of the Swedish National Heritage Board; photographer: Bengt A. Lundberg. She uses the example of the Ramsund rock engraving (Sö 101) of Mälar Valley in Södermanland, Sweden from the eleventh-century, which bears a close resemblance to the oral stories depicting Sigurd’s dragon-slaying. This suggests that this story was well known from the East Norse region, albeit not preserved in contemporaneous texts from that area. The carving on this stone shows a clear linear story. Next, Kate examines the rune stone (Ardre Kyrka VIII) in Gotland, Sweden from the eighth to tenth-century. Contrary to the stone in Mälar Valley, this contrasts various moments from a range of mythic and heroic narratives, as opposed to telling a singular story. The engraved stone (Lärbro Stora Hammars I) in Gotland, Sweden from the eighth to tenth-century truly embodies a medieval Scandinavian picture stone of images but there is scholarly debate on if it does indeed tell Sigurd’s story. This stone has many reoccurring motifs such as riders, ships, women, and battles—common of engravings of this time and place—which propose that these images might be carved or left out at will. This pictures do not convey a sense of storytelling but have become a good subject for researchers looking through a Christian lens. From this we see a comparison between the dragon-slayer and the protector of Christianity. Århus Mask rock engraving rune stone (DR66), Århus, Denmark. 10th cent., Image courtesy of CC-BY-SA-2.5; photographer Lars Zwemmer. Peter Pentz is a curator for the National Museum in Copenhagen, Denmark. His presentation, titled, ‘Face-masks’ – representing original masks or just faces? explores the idea of depictions of faces in rune stones and artifacts to determine if these representations indeed just symbolize faces or if they also serve as masks. Pentz argues that these face-masks are not related to the rise of Christianity, but instead are based in deep Viking tradition with depictions of birds, Odin and his ravens. He finds it curious that faces on rune stones oftentimes do not relate to the inscriptions but notes that especially on this type of stone, such as one in Århus, Denmark dating to the tenth-century and Släbro, Södermanland, Sweden from the early eleventh-century faces with braided beards are prominently featured. There are only two written sources that survive which mention masks, one from an account of a Christmas feat in Byzantium that was interrupted by Goths wearing masks and banging on their shields and another instance in Njal’s Saga with a man that was most likely Odin. One thing that is for certain is that instances of faces often offered a sort of protection over the item they were carved into. Face-masks engraved into churches that survived into the Christian and medieval period was still a signal in Norse culture that ”I am protected” showing elements of an older societal belief. In the end, Pentz sees elements of both masks and faces in the materials he studied. Danielle Turner is working towards her M.A. in medieval history from California State University, Fullerton. She has presented in past years at the Annual Conference of the Society for the Advancement of Scandinavian Study, been internationally published in Denmark and the United States, and most recently will appear on the History Channel show Vikings as a historical consultant on Norse Gods and the Vikings attacks on Paris.